With stark lines and dark coloring, the exterior of the new San Francisco Police Department’s headquarters was designed to project a strong and solemn presence. And that strength isn’t just a facade: the building is designed to remain structurally and functionally resilient for 96 hours following an earthquake or other disaster. The state-of-the-art campus, located in the booming Mission Bay area, houses a police station and a separate fire station on the ground floor along with the city-wide police department headquarters on upper floors. An historic firehouse located on part of the site was repurposed as offices for the Arson Task Force and community meeting space. The new construction achieved a LEED Gold rating for its environmentally sustainable design and construction, and the building opened in 2015. 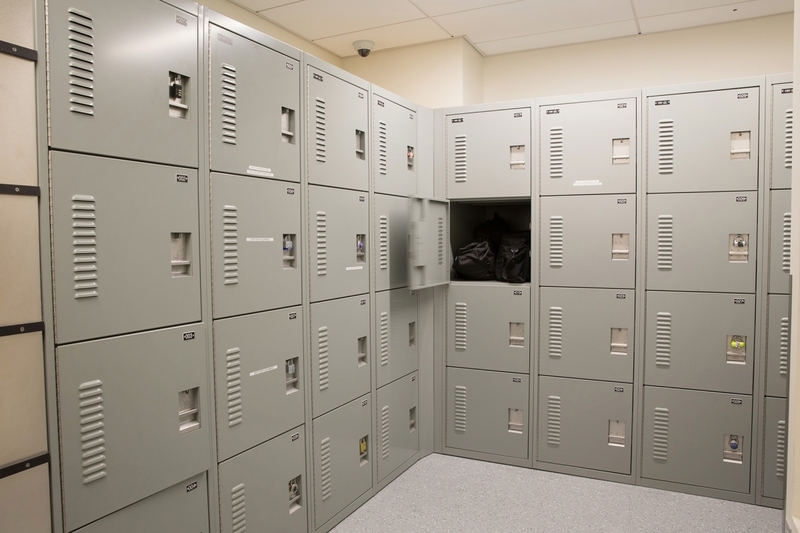 Given the facility’s need for enduring strength inside and out, planners determined that Spacesaver would be the best choice for lockers, gun cages, and other storage solutions. Systems & Space is a local business with a proven track record in public safety projects. The local Spacesaver affiliate got involved in the project early on, consulting with the city’s project architect to design and implement a number of storage solutions throughout the building. 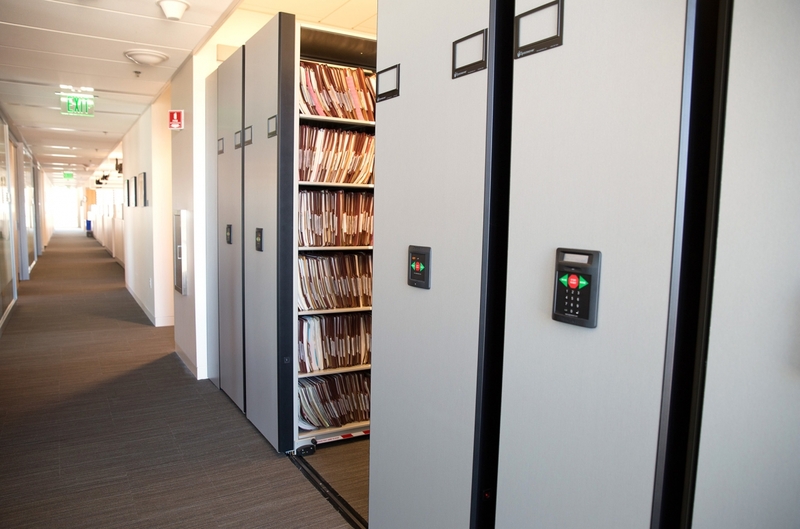 The Spacesaver consultant designed compact file storage systems for four floors of the police headquarters and one system for the fire department. Since San Francisco is located on an active seismic zone, Spacesaver’s structural engineers took extra care in designing anchoring mechanisms for the building’s mobile office storage systems. And the recycled steel content in Spacesaver products contributed to the building’s LEED rating. Spacesaver’s sally port lockers, also called handgun lockers, were installed near the police station’s booking area. Officers use these lockers to quickly store their handguns while they are processing suspects; the idea is to keep officers’ weapons safely locked away while they’re working on fingerprinting, data entry, and other tasks. Spacesaver’s TRL (Tactical Readiness Lockers) are conveniently located in a wide hallway outside the locker rooms. 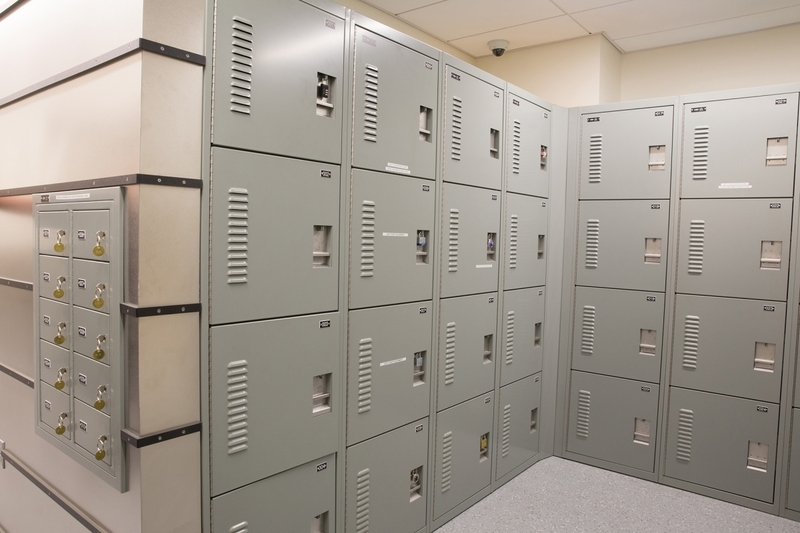 These lockers are designed to provide quick access to officers’ tactical gear, which can include riot gear, tasers, and body armor. Weapons racks store long guns in the weapons room. Spacesaver’s heavy-duty steel weapons racks are durable, sturdy, and secure. They can be configured to hold weapons of various sizes, and these configurations can be easily changed over time as weapons are acquired or retired. 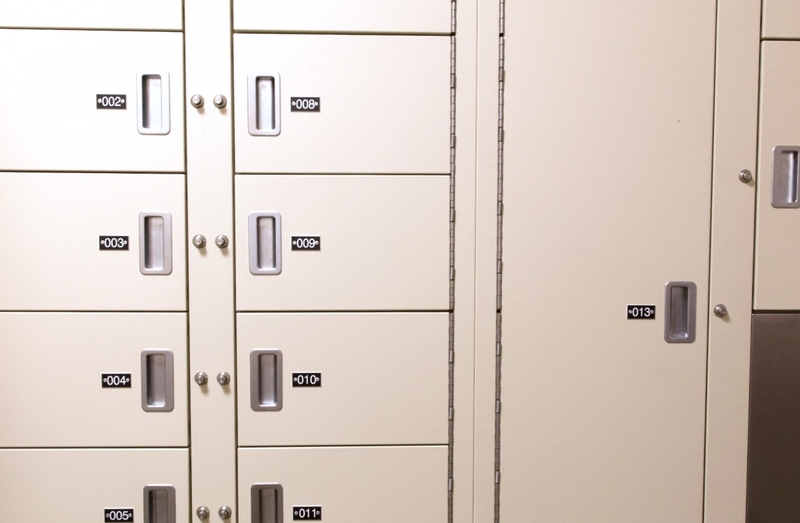 Long-term evidence storage is still located at the department’s old headquarters about a mile away, but Spacesaver provided the department’s temporary evidence lockers on-site. When the temporary storage lockers are approaching full capacity, an evidence technician transfers the items to the long-term storage facility. We take pride in providing careful attention to detail throughout the planning process as well as service long after the sale. For this project, we coordinated the timely installation of storage systems throughout the building and provide ongoing maintenance and support for Spacesaver products. 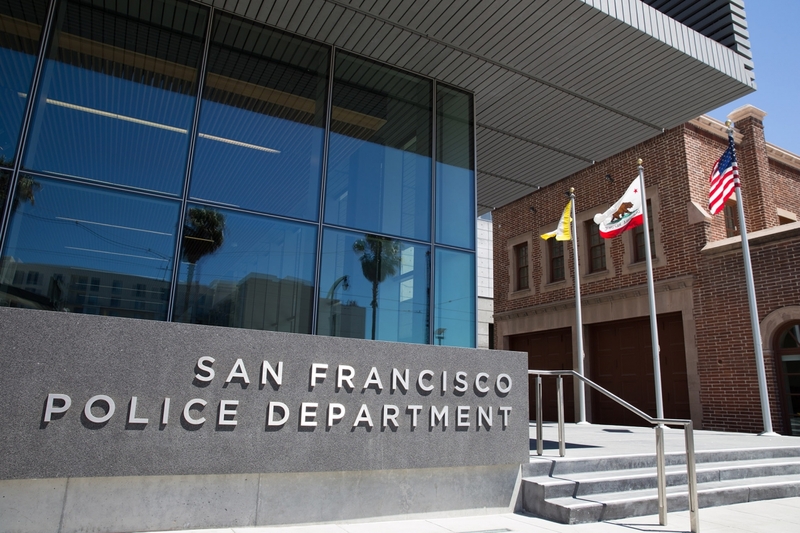 The new police headquarters is a strong presence in San Francisco, and Spacesaver products ensure that the storage components at its core are just as strong and secure as its exterior. 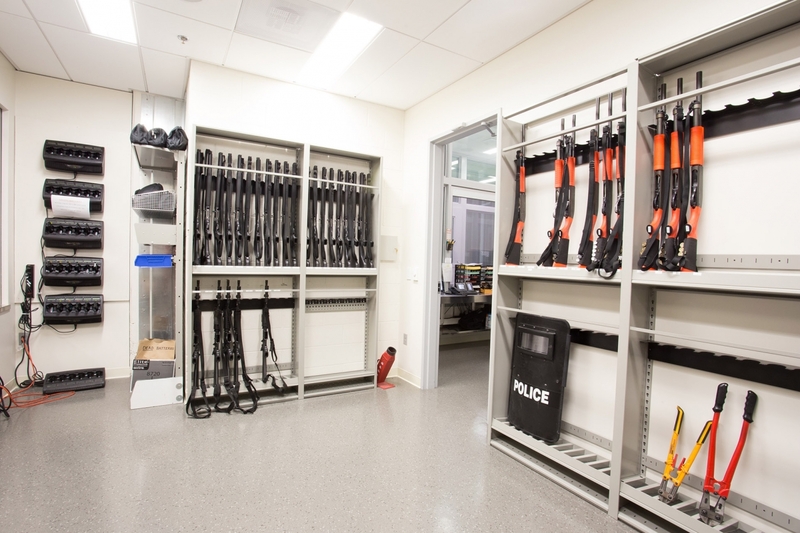 Learn more about our public safety storage solutions by visiting our law enforcement market page, or download our Public Safety Solutions Lookbook.